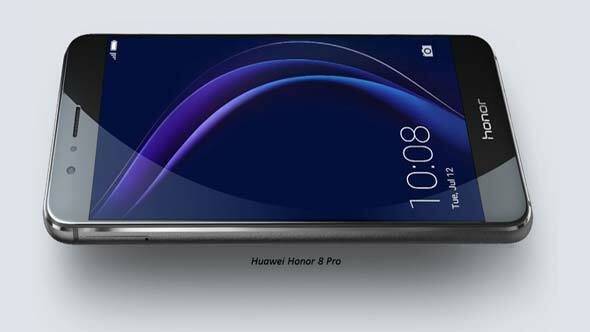 Huawei company launched his latest Huawei Honor 8 Pro smartphone in the Indian market. Huawei Honor 8 Pro comes with dual SIM, 4G VoLTE support. This is pretty good, powerful smartphone which is able to run heavy application. This smartphone is available in Navy Blue and Midnight black colour variants in the Indian market. Finger print sensor of this phone is located at the back panel which allows you to quickly unlock your phone. Huawei Honor 8 Pro smartphone was officially launched in April 2017. Now this smartphone launched in India before few days ago. The Huawei Honour 8 Pro dual sim, 5.7 inch touchscreen smartphone is priced at Rs. 29,999 in the Indian market. This dual sim smartphone is powered by 1.8GHz octa-core Kirin 960 processor along with Mali G71 MP 8 GPU. This smartphone comes in with 6 GB RAM and 128 GB internal storage capacity. You will get approx 3GB free RAM and 101 GB ROM during the first boot. The Huawei Honor 8 Pro Smartphone comes with latest features and stylish design. This smartphone comes with different great features. This smartphone launched in the Indian market on last Thursday. This dual sim smartphone comes with a 5.7 inch touchscreen with LTPS IPS LCD capacitive touchscreen, 2.5D curved screen with 2560 x 1440 pixels resolutions. This smartphone comes with Corning Gorilla Glass 3 protection which protect your phone from scratches. This dual Nano+Nano sim comes with micro SD hybrid slot. This smartphone is running on Android Nougat version 7.0 Operating System. As per the camera concerned it will get 4.8 points out of 5. You will get 12MP RGB, 12MP monochrome rear camera with f/2.2 aperture, phase detection and laser autofocus with dual LED flash. This smarpthone has 8MP fixed focus front facing camera with f/2.0 aperture. You can also get video recording feature for max 4K resolution with wide aperture in video. If we talk about the connectivity feature this smartphone comes with 3G, 4G, VoLTE, WiFi, GPS, Bluetooth, FM and OTG support. You can also get Finger print, Proximity sensor, Accelerometer, Ambient light sensor, Magnetic and Gyroscope. The dimension of this smarpthone is 157 x 77.5 x 7 mm which comes with Non-removable Li-Pron 4000 mAh battery. With the help of 9V/2A charger you can full charge your smartphone with in 3 hours. You can heavy use this smartphone from 4 to 6 hours non stop uses. As per compared all the features of Honour 8 Pro smartphone with OnePlus 5 you will get one step ahead of this smartphone. It is pretty good, excellent finishing, stylish, powerful smarpthone. It is able to easily control temperature up to 45 degree comes with Quad HD display.